Need a new 4x4 decal? Or do you just want to try a different color? 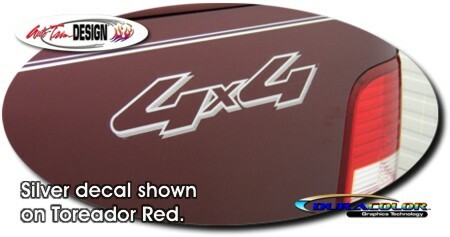 In either case, this decal set closely matches the Ford F-150 and can be obtained in one of four (4) different colors. This decal product is manufactured from premium cast adhesive-backed automotive grade vinyl materials with an image that is printed to the surface with our DuraCOLOR Graphics Technology. Kit is packaged as a set of two (2) decals. Please Note: While decal may closely match that of the factory design, colors offered herein may not.